If there is one thing I’ve learned, it’s that people take their Classic German Potato Salad very seriously. Please take my version with a grain of salt, I am not claiming that it’s authentic, but I’m just going to add that this is my copy of a German potato salad that I ate in a pub in Karlsruhe Germany and have been meaning to replicate ever since! Do I trust that pub in Germany? Maybe, maybe not. I ordered the MEATLOAF and potato salad and received what was basically a loaf made from hot dogs or bologna. Meatloaf in Germany can most definitely not be what we consider meatloaf here. I have since found out that Leberkaese was what I ate and was called meatloaf, and yes the texture resembles bologna! “Leberkaese consists of corned beef, pork and bacon and is made by grinding the ingredients very finely and then baking it as a loaf in a bread pan “. Luckily I like bologna/hot dogs and happily ate it, but it’s the potato salad that I remember the most. It was SO different from the heavy mayonnaise based salads that we eat here in North America. It was tangy, hot and so light comparatively! What is German Potato Salad? 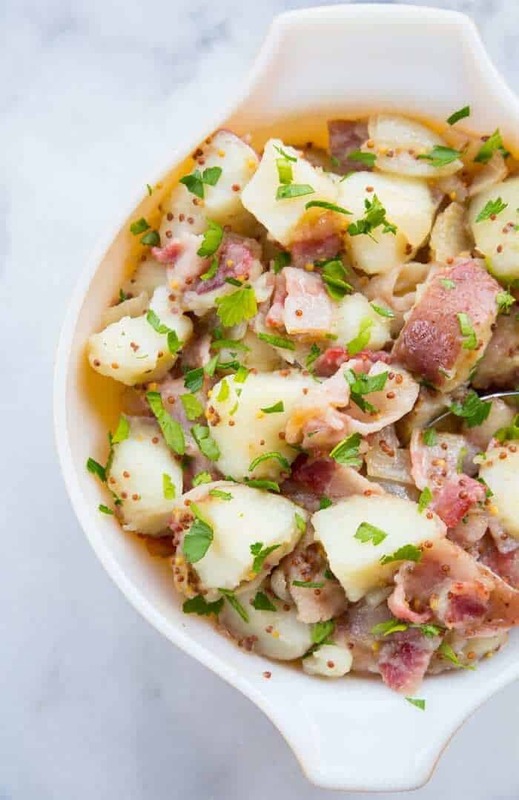 German Potato Salad is made from potatoes tossed with bacon and vinegar, to be concise. The dressing can use apple cider or white vinegar based, and there is NO MAYONNAISE. I know, this is hard to wrap our North American brains around for sure, how can a potato salad not have mayo? Well, German potato salad doesn’t. Consider it the vinaigrette version of our heavy mayo-based traditional potato picnic salad. German potato salad can be served hot or cold, but it’s especially nice served hot. 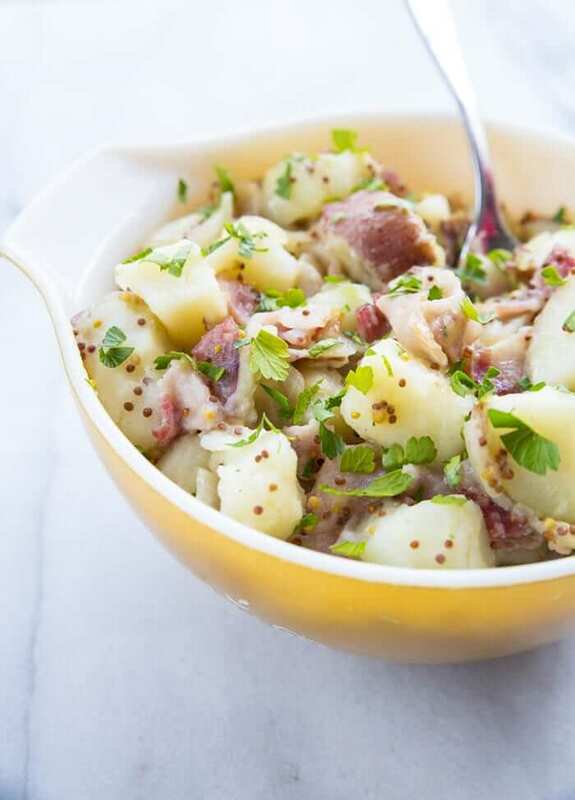 Can I use apple cider vinegar in German Potato Salad? Always use a waxy potato like red potatoes. You want the potato to stand up to being boiled, drained and tossed in the dressing. A Russet potato will absolutely fall apart into mush if you use them. Adjust the mustard flavouring to your own liking. Using a whole grain mustard adds a fantastic taste and texture and there are many varieties available in your local grocery stores. Make sure that the onions are fully cooked before you add the vinegar. The acidity will actually STOP the onions from cooking further sometimes! You don’t want crunchy onions in the salad. Happy cooking! Let me know if your family has a traditional version of German potato salad, I’d love to hear it! 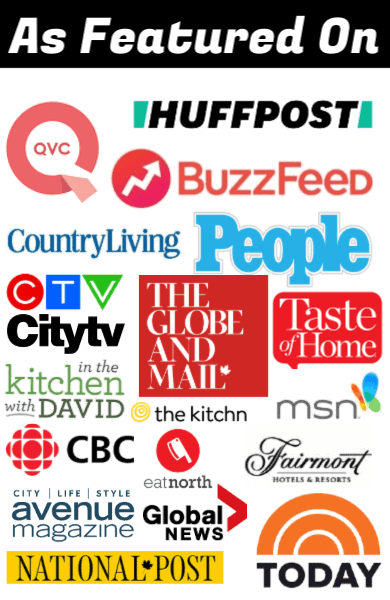 Pin this to your Salads Board and remember to FOLLOW ME ON PINTEREST for more great recipe ideas! 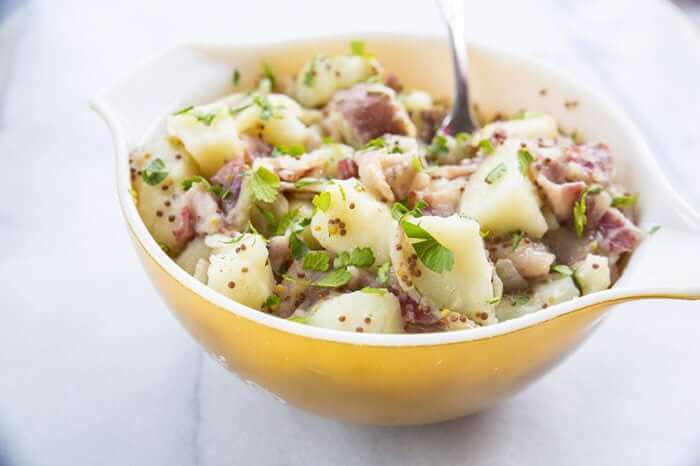 This German potato salad is tossed in a vinegar, onion and bacon dressing, with a whole grain mustard added in for a delicious, crunchy kick! Place the diced potatoes into a large pot and fill with enough water to cover the potatoes completely. Bring the water to a boil, and cook for about 10 minutes, or until the potatoes are easily pierced with a fork. You don't want them to start falling apart when pierced, however. Place the bacon and onions in a large skillet over medium-high heat. Fry until the onions are soft and translucent and the bacon is cooked. Add the liquid to the skillet and bring to a boil. Add in the potatoes and parsley. Spoon into a serving dish or bowl and serve. Adjust the amount of sugar in this to your preference. Mike liked it tarter, I liked it slightly sweeter. It's up to your personal preference. Also adjust the whole grain mustard to your own liking. I LOVE the stuff and will use more next time. Oh this is close to my Oma’s! 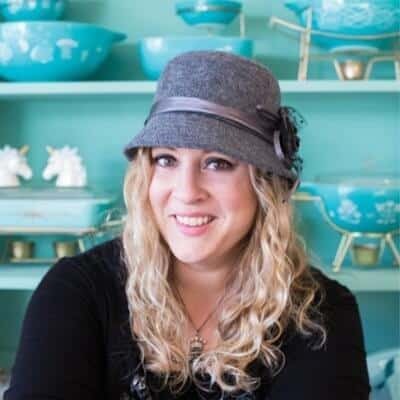 She uses caraway seeds and they are the best! Try it!